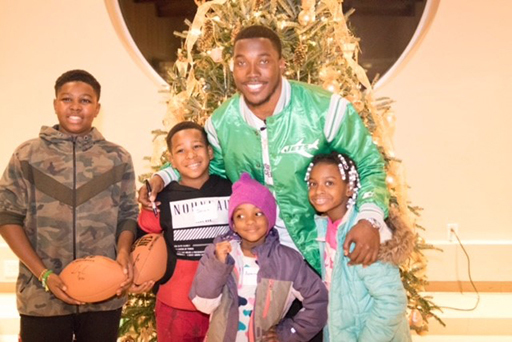 WASHINGTON, D.C. – Doug Middleton has been named Week 15 NFLPA Community MVP for giving holiday gifts to 32 kids from low-income areas and increasing mental health awareness. When Middleton reported for training camp in July to start his second NFL season, the day’s excitement was overshadowed by the funeral for his childhood best friend, A.J. Morrison. After suffering from severe depression for three years, Morrison committed suicide, leaving Middleton heartbroken yet determined to build upon his best friend’s legacy. Soon after, the “Dream The Impossible Initiative” was born. The organization’s mission is to support children in underserved communities while emphasizing the importance of mental health. For Middleton’s first event on Dec. 16, he travelled back to his hometown of Winston-Salem, North Carolina and hosted 32 kids for the “Let Your Light Shine Celebration.” The children were given a variety of gifts, including an Xbox, video games, bikes, sports toys, jerseys, shoes and winter coats to help enhance their Christmas experience. Middleton and a mental health advocate also spoke to group – all of whom had been affected by mental health in some way – providing encouragement and motivation to help push them toward their dreams. The event culminated with craft building and a hearty holiday meal for the 100 students, families and teachers in attendance. Although a torn pectoral muscle sidelined Middleton for the entire 2017 season, the Winston-Salem native has used the extra time to pour back into his community. He has volunteered multiple times at the Charlotte Rescue Mission by serving breakfast to disadvantaged men and worked with the Western Youth Networks Big Brother program. This spring, Middleton will serve as the leader of the 14th annual NAMIWalks North Carolina, which is the largest fundraiser for the state’s National Alliance on Mental Illness. In between studying for his master’s degree in public policy, Middleton has also been working with the Winston-Salem/Forsyth County school system in North Carolina and Brandon Marshall’s Project 375 organization to plan a mental health training event for teachers. In honor of Middleton being named this week’s Community MVP, the NFLPA will make a $10,000 contribution to his foundation or charity of choice along with an in-kind donation to him on behalf of our supporting partner Delta Private Jets. Middleton, along with the other 2017 Community MVPs, will also become eligible for this year’s Byron Whizzer White Award, which is the highest honor that the NFLPA can bestow upon a player.